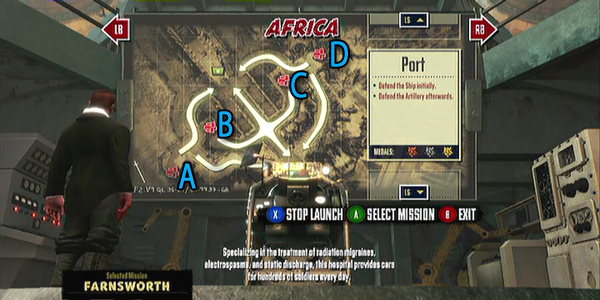 Contrast to Hospital, Port is one of the most fun and simple maps Africa has to offer. This map is very easy to control, a center-lane has the focus of the action with the side-lanes being the places where you’re likely to take damage from. Setting up for Port is simple, you’ll want three machinegun/shotgun turrets in a triangle defending the ship, one per lane (shotguns should be further into the lane to stop Tommys) and a dampener in the center lane. From there, make sure to deathsplode (with a deathsplosion broadcaster) all the Knobs that pour out of the center and just about anything else really. 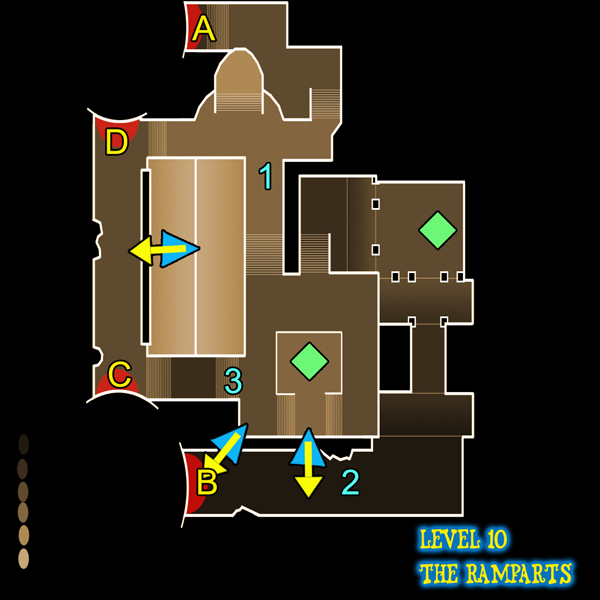 It’s important to note that wave 6 spawns Tommys from A, then D, then B and C, so deal with them in that order. Wave 7 and 8 will likely destroy most of your turrets, just be sure to clean up all the enemies you see and don’t bother rebuilding emplacements. After wave 8 the level switches to the other side (the desert-ish side), but the lanes behave symmetrically so it’s the same setup. However, this time if you have machine gun turrets you can place one on either side of the center lane outside the lane where they can cover a side and the center. Each lane should have a dampener, and with all the scrap you’ve saved up you should be able to get an extra two center turrets for security (or lane turrets, depending on where you’re focusing). Just be sure to hit Breakers with the grenade launcher, and get close on Bertha so the deathsploding Knobs will hurt her. This mission is really easy and really fun, so come back and try it differently. Engineering: Use mortar turrets placed safely up the side-ramps to cover the center crossroads, keep them upgraded and they’ll make the center nothing but knobs, which can easily be cleaned up with MG turrets or Trench MGs. Use dampeners to make the most of your mortars. Double Broadcasters: This one’s just plain fun. Get close and eat everything in your wake, put emplacements on the sides and watch the center all on your own.